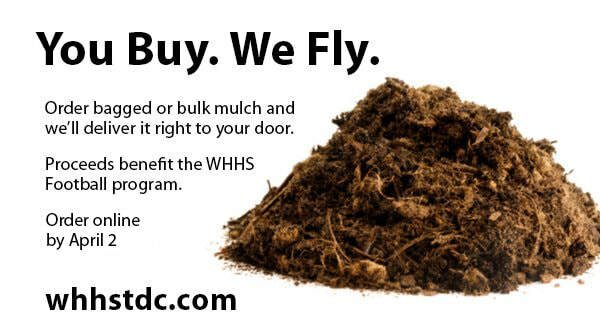 The annual Mulch Madness sale is the primary fundraiser for the WHHS Football program. Over 80% of the Touchdown Club's operating budget stems from this event to support uniforms, pre-game meals, equipment, camps, coaching support, and more. On your order, please note the football representative who encouraged your sale and thank you for supporting our largest fundraiser of the season! Bags of mulch may be purchased online or by providing this ordering form (pdf), along with your payment, to your football representative. Pickup from WHHS at no charge on April 20, 9am - 3pm. WHHS players will load your car/truck. Bulk mulch may be purchased online or by providing this ordering form (pdf), along with your payment, to your football representative. Bzak will deliver the mulch to your home or business on a date you specify (Monday through Saturday). You may also request to pick your mulch up from Bzak. Everything you need to know to have a successful sale is available in this summary. Parents/Players: Promote the Sale on Social Media! Right-click on the image below to download it to your device or computer. Share it on social media with a link to this page.